Great people make great coaches. Great coaches make great people. Great coaches make great athletes. Great athletes make great coaches. An extremely famous or notorious person, especially in a particular field. Any and all of those things apply to Paul "Red" Jenkins. I wont talk about the reason why a lot of people think of Coach Jenkins. I will start with what I think of when I think of this legend. That light that shines brighter, that smile than shines bigger, that laugh that booms louder, and the wisdom. That brilliant Red Jenkins wisdom. If you have spent one moment in a one on one conversation with the man, you understand that you can not leave it the same as before you had it. You can not feel smarter, taller, better. Coach Jenkins has the ability to make giants smaller, children taller, and adults childlike in their joy. He has the gift of being able to inform you without making you feel uninformed, and that you are now smarter than you really are. And better. You feel better. Not all humans have the ability to be legend and worth of it. Not all humans want it. I am pretty sure that he will disagree with my saying it, but that it ok. He knows exactly why it needs to be said. LovePrints is loving and learning through sports, and I can not think of any coach who exemplifies this more than Coach Jenkins. 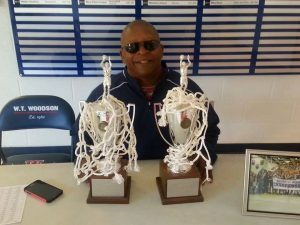 While he has a lineage of famous players who played for him, and successful seasons of winning behind him, it is the love that his players and students speak about when Coach Jenkins name is brought up. There is a glow that takes over, and it is from deep within. Anyone who knows how few coaches and teachers are authentically remembered, Red does not have that problem. He is remembered deeply, and freshly. And he is worthy. I first heard about Coach Jenkins as a very young man. I heard these tales of greatness about the Drill Sargent of a leader in Fairfax, Virginia. His drills were epic, his voice was familiar, and his ability to win was never questioned. His teams were well coached, well disciplined, and really tough to beat. His players became coaches, his opponents became fans, and everyone understood why this was the case. He was worthy. Later in life, as sports took me out of the area, I would often find love prints of Coach Jenkins out in the larger world. Some former player of his in Atlanta, some coaching buddy of his in Charlotte, some opponent of his teams in Utah, and a coaching protege in Houston. I would hear him in the voice of radio in DC, I would hear about his victories in California, and I would see him in Basketball documentaries on television. He was everywhere. His LovePrints were everywhere. My coaching life too me to the HOUSE THAT RED BUILT. WT Woodson High School in Virginia. The gymnasium carries his name. The banners carry his legend. And the community calls his name. 20 plus district titles, 600 plus wins, and enough love to fill Main Street. Honor, after honor, after honor. A basketball tournament in his name. And it may not be enough. Funny thing he would be an amazing baseball or football coach too. He is that kind of leader of young people. No matter what charge given, he would be perfectly out front and leading. He is an encyclopedia of local and national folk tales and facts. He can spin a story like no one else, and in each one is a lesson. In each one is a purpose. And in each one, there is a little bit of glory. A little bit of greatness. A little bit of Red. Coach Jenkins does not need for me to write about him. Not as a man, or a coach. I needed to. He has shared so much of himself to so many. I want to give some of it back to him. He deserves it. I am a better man because of him. I am a better coach because of him. I am a better human because of him. If you have ever met the man, you are as well. If you ever played for the coach, you are as well. If you ever loved the human, you are as well. We used to meet on Tuesdays and have coffee. As a lifetime talker, I was always impressed by those who got me to lean in, shut up, and listen. Coach Jenkins did that. And every Tuesday, I would shut up, lean in, and listen. And, I would love. Today, I love out loud. Thank you for your LovePrints Coach. Love Out Loud. Love in Action. Action in Love. One act at a time. In some cases, one smile at time. One smile. Each smile is an act of love. Every single one. It is an act of love out loud. It is never selfish. It is never for the person giving it. It is always for the person receiving it. It is all about the person on the other end. It is all about the smile received. A smile is the acknowledgement of another, each other, and us. It is the statement of looking for one another, searching for one another, and finding one another. A smile is a statement of who you are, who we are, and a strengthening of the connection that we all want and need. As a educator, it is the YES to the lesson and the learning. It is the signal that you see and are seen. It is the alarm for something good, the telling of the truth, and the exclamation point to why we do what we do. As a parent, a smile is the security blanket, the temperature taker, the meal planner, and the nurse. It answers questions, tells the truth, and seals the deal. A smile is a question, answer, and verification. It tells us everything. As a coach, it is the opening mission statement, the practice plan, and the locker room captain. A smile says that we are ready, we are prepared, and we can do anything, together. A smile is the sign on your face that we belong, we deserve, and we earned this. A smile is the sign of improvement, vision, and growth. A smile says that I care, I am here, and that we are still connected to one another. A smile is the win, out loud. As a man, its is the key to the door, the introduction to the masses, and the nodding to the next thing. It is the acceptance of the journey, the confirmation of success, and the celebration itself. The smile is medicine, therapy, exercise, and the fruit of our labor. It is the mixer, the appetizer, and the dessert. It is the final ovation, and the reason why. The smile is powerful. Some might say that it is undefeated. It can change conditions, circumstances, environments, and lives. If you so choose, it can change us all. Go. Action in love. Love in action. Love out loud. LovePrints. A conversation between Generals. Positive thoughts. Love in Action. Love Out Loud. The ideal interaction leaves a loveprint when done. Well done. We hope that you enjoy this podcast interview with Joe Winters, Jr of the Daily Path, and Derrick Pearson of LovePrints. Feed yourself with something good.